According to the US Department of Health and Human Services, 22 patients die each day in need of an organ transplant because the demand for organs far outpaces the supply. If the compelling idea of producing 3D printed organs is realized many lives could be saved. A big challenge in this field is to produce printable material that can support cells and is also permeable to nutrients. A hydrogel is a type of synthetic cross-linked polymer that is highly water absorbent. Hydrogels are commonly used as tissue engineering scaffolds for cells because of their biocompatibility. This is a hot topic in the field right now, and many people around the world are working on developing new bioprinting methods. A challenge to the development of these methods is how well the printed object corresponds to the plan. A group of Chinese scientists did a study of how various printing parameters affected printing fidelity. They published their results last week in Scientific Reports, the premier scientific journal Nature brand’s open source online journal. The printing material or bioink must be liquid before printing and gel after printing. To make their hydrogels, they used sodium alginate (the same material this group used to print vasculature), gelatin, and a solution of calcium chloride as a cross linker. In order to develop a bioprinting process, they feel it is important to understand the impact of changing the printing parameters including air pressure, temperature, feed rate, and printing distance. Another parameter included the ratio of gelatin and alginate. Using a lab-built 3D printer, they started out with printing 1D lines on a flat surface, connected at different angles. They moved on to lattice shapes as shown in the image above, looking at how well the lattice maintained its shape with different line spacings. 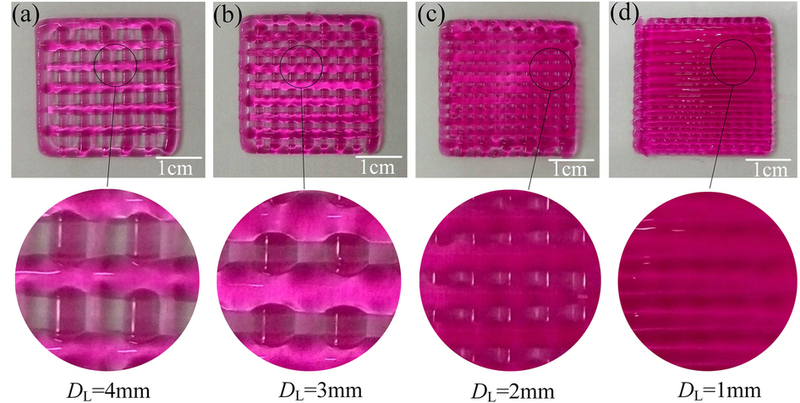 The hydrogel tends to spread somewhat upon printing. The printing surface was cooled so that the gel formed. The experiments also determined the impact of gravity. They used extrusion based printing as opposed to other types of printing because cells are sensitive to thermal and mechanical stress. They found that the 3D printing process did not damage or kill mouse fibroblast cells suspended in the hydrogel as it only had a slight impact on cell survival. Finally, the looked at a 3D object with successive printed layers as shown in the figure below.